Starting Kindergarten is an exciting time in a young child’s life filled with new experiences and opportunities to learn and grow. Kindergarten Registration at the York Catholic District School Board is now open. The Board looks forward to welcoming new families for the 2018-2019 school year. Children must be four years old by December 31, 2018 and born in 2014 to register in Junior Kindergarten, or five years old by December 31, 2018 and born in 2013 to register in Senior Kindergarten. 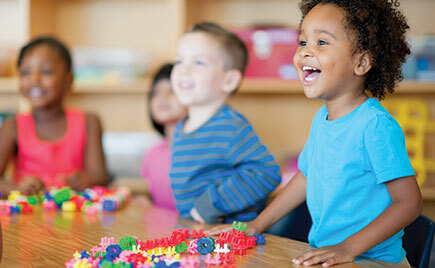 The Full-Day Kindergarten (FDK) program teaches children through inquiry and play-based learning methods. Teachers and Early Childhood Educators work together in Kindergarten classes to support the unique needs of each child. Children explore their world through play and real-life experiences. In York Catholic’s FDK program, students talk to their classmates as they actively engage in problem-solving and inquiry in an atmosphere of fun and cooperation. The FDK program helps children d­evelop a solid foundation for their future learning by enhancing their social, emotional, cognitive, language, and academic skills in a safe, caring, nurturing and fun environment. To determine which York Catholic elementary school offers the Full-Day Kindergarten program in their local area, parents and guardians should either visit http://locator.ycdsb.ca/, or call the Board’s Admissions Department at 905-713-2711 or 416-221-5050. Parents and guardians who wish to register their children in the York Catholic District School Board FDK program should bring the original documents listed below to their local Catholic school during regular school hours, and are encouraged to call the school ahead of their visit. Students currently attending Junior Kindergarten at a York Catholic school do not need to re-register for Senior Kindergarten. Learn more about York Catholic’s FDK program.